Has your commercial or industrial building been affected by hail, high winds or a hurricane? If you would welcome a better approach to the endless cycle of constant repairs and costly replacement, DFW Urethane has you covered. Our high-performance retrofit solution will get you back to normal in less time and with less disruption. Simply patching your existing roof doesn’t address the underlying source of leaks or offer the same benefits. DFW Urethane’s spray polyurethane foam roof system is far more effective. It is a watertight, durable alternative to conventional and rubber roofs that ends leaks for good. And, because it serves as high-tech insulation, this advanced retrofit solution also reduces utility costs. We respond quickly and coordinate with your insurance company. 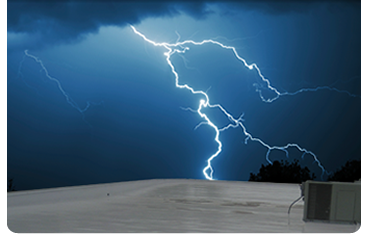 We provide emergency repair services following severe storms to minimize damage to your building. Our insurance industry experts can supply forensic evidence of damage to help you settle your roof claim. SPF roofing systems are faster and easier to install because they can be applied directly over existing roof coverings. There is no need to tear off and dispose of existing roof materials. This minimizes the costs, risk and disruption associated with removing the roof and rooftop equipment. Our SPF roofing solution is waterproof. Not only does it keep out water, it performs well against hurricane-force winds. Foam roofs last indefinitely and are trouble-free, so they are more cost-effective over the long term. Spray foam offers a high R-value for lower energy bills. Our customers have saved 33 percent based on average foam thickness. DFW Urethane’s SPF roofing system carries a 10- or 15-year manufacturers’ warranty depending on the specific project. Hail is the biggest culprit in damaging roofs – and the biggest driver of skyrocketing replacement costs. If your facility absolutely cannot sustain roof leaks or water damage, a custom hail-resistant roofing system is your smartest investment. One of the very few roofing systems that can handle severe hail, this solution is ideal for data centers, medical facilities and other environments that must remain leak-free. DFW Urethane’s proven FM/SH-rated roofs are custom-designed and -installed to remain solid, waterproof and structurally sound. They couple rigid spray foam that has a high compressive strength with an average 45-mil-thick Neogard Permathane II elastomeric polyurethane coating. Are proven to withstand hail up to 1¾” in diameter without leaking. Stretch and move to minimize damage. Boost structural strength and add rigidity. Offer an I-90 wind uplift rating, depending on the type of existing roof. Can be installed with additional foam for energy savings. Offer 10- and 15-year warranties, depending on the system. We are responsive, highly respected and performance-driven experts. Discover how retrofitting your roof with an SPF system will stop the leaks and save money for good. Call DFW Urethane today! If you have any questions or if you would like a free estimate, click below.